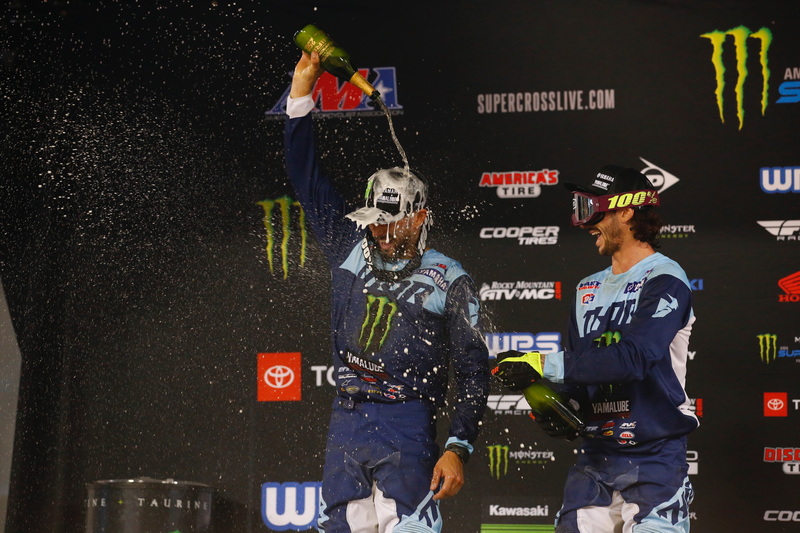 It was another night of tough conditions in the 250 class, but Dylan Ferrandis and Colt Nichols managed another top performance to bring home another double podium for the Monster Energy Star Yamaha Racing team at round four of the Monster Energy AMA Supercross season at Oakland-Alameda County Coliseum. Nichols got off to a great start with the holeshot, but fell back to second and went on to manage his race on the soft, rutty track in Oakland. Meanwhile Ferrandis had his head down and went charging through the pack to challenge his teammate. He swiftly moved past Nichols, but time ran out to continue his progress for that top step on the podium. The Frenchman’s speed was not surprising. He was the fastest qualifier and won his heat, but another poor start meant that he had his work cut out for him to take the win, the final result was another solid second-place finish for Ferrandis, the team and the Yamaha YZ250F. Nichols crossed the line behind him in third, making it another double podium for the Monster Energy Star Yamaha Racing squad and making him the only rider in the 250SX West Championship who has yet to miss a podium appearance this season. It was an important points haul to give him a three-point lead in the standings. Teammate Ferrandis sits not far behind, just five points back in fourth. The Monster Energy Star Yamaha Racing Team heads down south to San Diego, California, next Saturday, February 2, for round 5 of the Monster Energy AMA Supercross Championship at PETCO Park.